love the simple colors of this classic glam farmhouse bathroom. 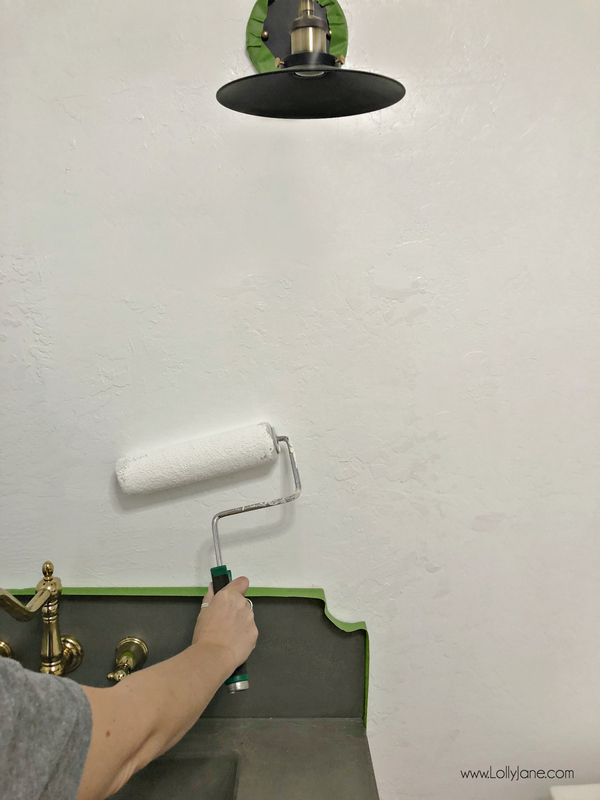 spruce up your space in less time by using the right paint. 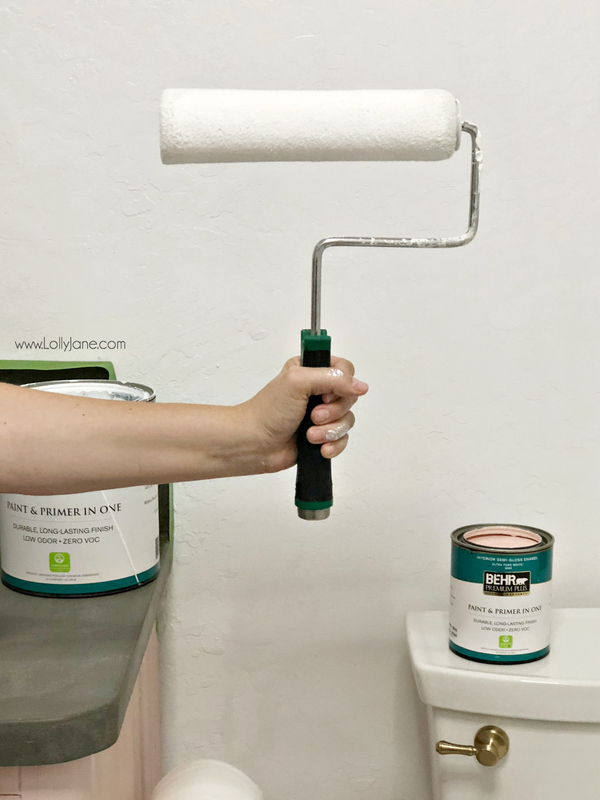 check out the best paint colors for a small bathroom! 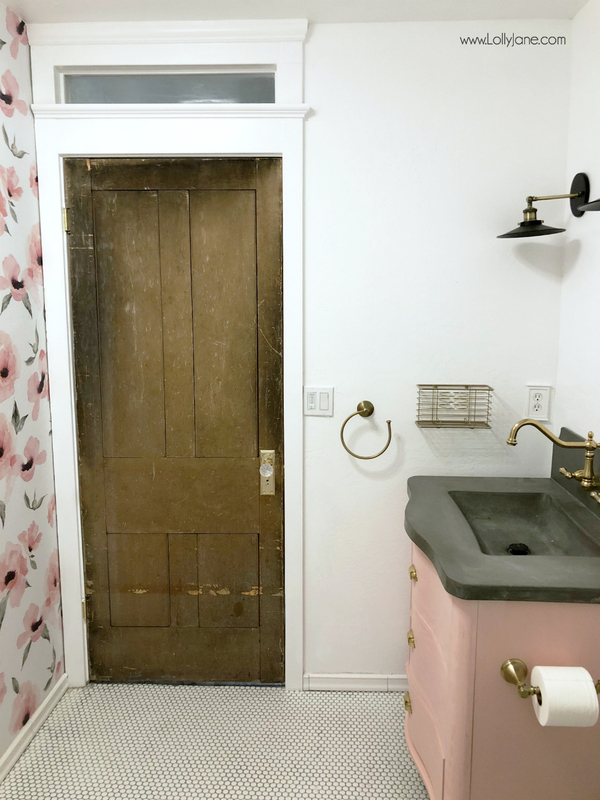 I just finished my major bathroom renovation and since I chose to paint the vanity a fun pop of color, I decided to keep the walls a neutral hue so it wouldn’t compete and wow! They pair perfectly together and it took me hardly any time at all to coat all the things, (walls, vanity, ceiling, trim and all those shelves!) thanks to BEHR PREMIUM PLUS® Interior. You know we love the paint and primer in one, it cuts down your painting time and covers better, no brainer! Check out how spotty this wall was after the texture was applied. When choosing bathroom colors for small spaces, consider going lighter so the room looks bigger. We don’t have a window in this room so we decided to go all white to really brighten up the area, we used Ultra Pure White in Interior Premium Plus or Marquee (Semi-Gloss). We let the pink do the talking so it really pops when it’s actually only in two spots in the room. Grab samples at Home Depot but be sure to test the colors in your room and not just how they look in the store lighting. If you need pre-store inspiration to narrow down your color scheme, play around with the Behr Color Studio. You can see real rooms, select a mood and even upload your own image to preview your room. 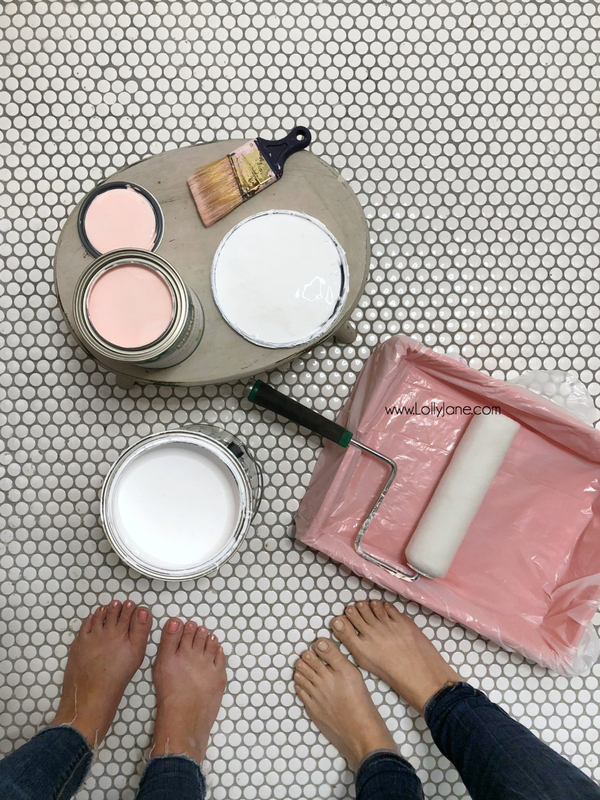 We personally can’t get enough of the Behr Color Trends, the Positively Pink T18-01 just screamed at us that it wanted to be included in our bathroom remodel so we had to oblige! We swapped the marble top of our vanity for a custom concrete counter top. We love how the gray with the pink makes the soft hue more sophisticated. The gray counter also ties into the grout to create a cohesive paint palette. 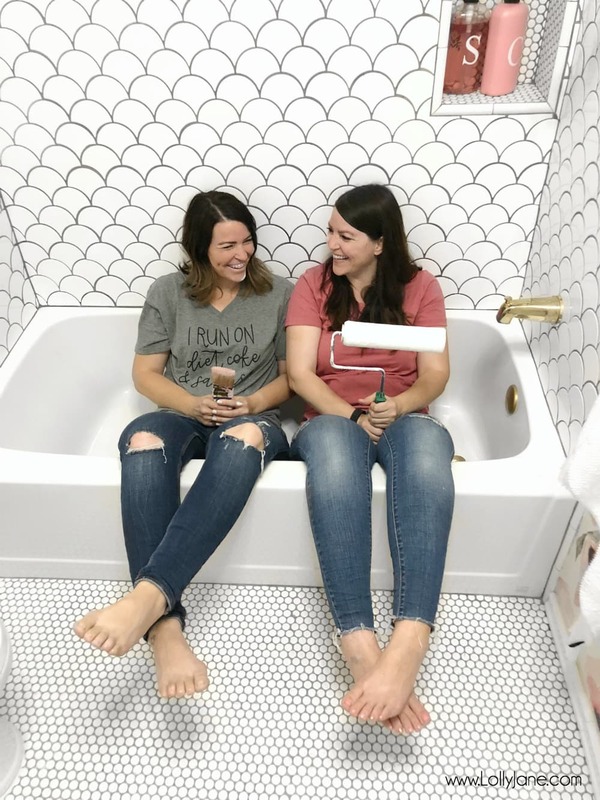 Painting with a pal is much more fun so grab your sis, best friend, kiddo, spouse or partner and get to painting! You’ll be surprised how much faster the progress goes and how little it feels like work! Let us know what Behr color you’d love to try via this form for a chance to win a $100 gift card to Home Depot! Good luck! 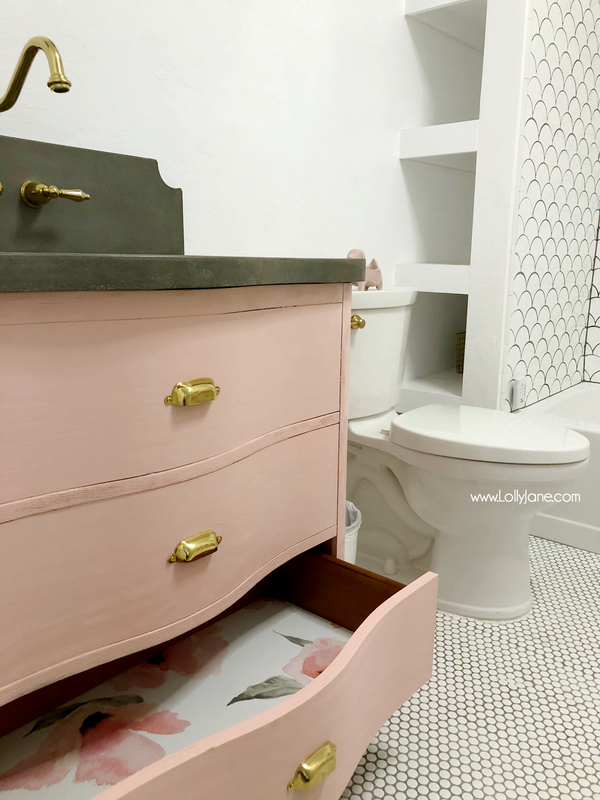 Easy Kids Bathroom Refresh. Bonus: free printables! Those are some really beautiful color ideas to have in a small bathroom. So pretty in pink. I love pink and I am so over joyed it is making a come back! I am so happy I found you on our link party! Pretty in pink. I love pink and it is finally making a come back to home decor. Happy I found you at the link party today love your blog!